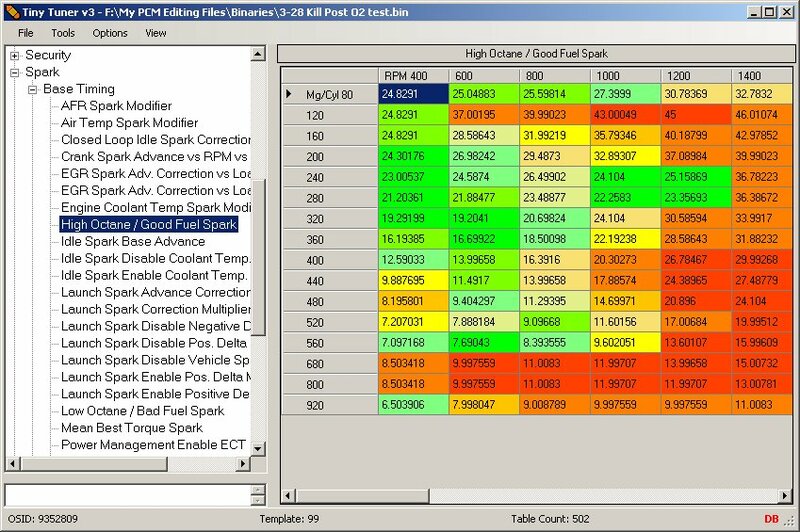 This program is the result of many hours sitting in front of a computer looking for tables to improve our tuning ability. I could not have done this without the help or GTPRedfire, blemke, Perforator, and Zalfrin. Please thank them as well if you decide to use this program and feel it's worth the time it took to develop it. 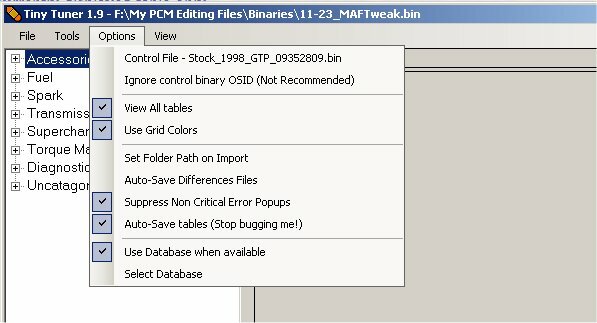 List Differences Between Files - This will give you a list of all of the tables that are different in your control file vs the main file you have loaded. Here is a copy of what this report looks like. This lists the differences between my current VCM file and a stock VCM file for my car. List Available Support - This will list all of the OSIDs the program supports. This is kind of messy now, I may make it neater later or just delete this menu. Get MAP number for an OSID - This will display the MAP number for an entered OSID. Again, this is mainly for development and mapping. Use Grid Colors - this is used when a control binary is loaded. It will change the back color of each cell depending on the amount of the difference between the two files. Suppress Non-Error Popups - this will cause the program to not display most messages, unless there was an error. AutoSave Differences File - If you have this option selected, you will not be prompted for a file name when using the List Differences Between Files tool. The file is automatically saved as "_Differences.txt" in the programs default export folder. Tables that are exported from the Tiny Tuner have 2 sections. The top section is the main table display, and the bottom section is the same data, but in csv format. I did this for simplicity - this way I can export 1 file and use it to either view the table in text format, or import the file later. To File - This will export the current table to a text file. If the pre-coded table modifiers (Add To Selected and Subtract From Selected) are not what you need, then the custom menu may help. 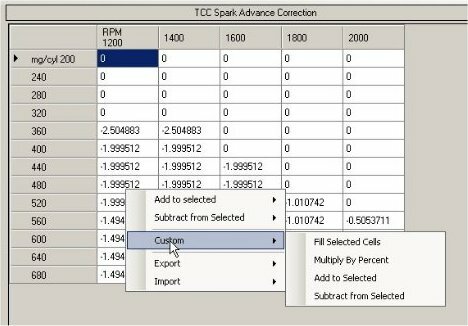 You can add or subtract selected cells by any number, multiply by a percentage (entering 100 will make no changes - 50 will cut the value in half), or filling the selected cells with an entered value. 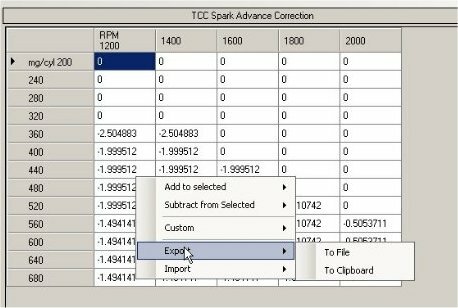 Wanted to be able to copy only a portion of a table, so I added "Copy Selected" and "Paste Selected" to the context (right click) menu. The table structure has to be the same in both tables (ie same number of rows and columns) and the data will be copied to the same location as the selected data in the original table. First public release - too many changes from original version to list. Added copy and paste keyboard shortcuts - will copy 1 cell and paste that value to every selected cell. Lost the *. * filter in the 'Open File' dialog - you will only be able to open files that have a bin extension. Added a list box for the parameter list. Click on the View menu to toggle between the list box and the tree view. Added an option to view whole numbers for all timing tables. This will display whole numbers for EVERY parameter who's main category is "Spark". 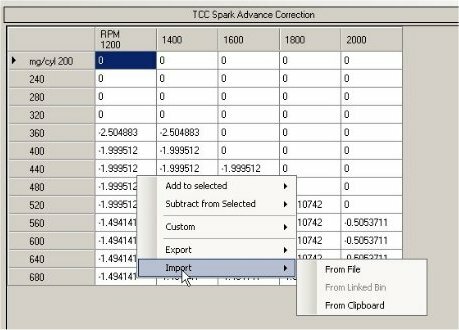 If you want to display whole numbers in select tables, use the binary editor to change the 'Display Whole Numbers' parameter for the select tables. This does not change anything in the database, it only effects how the values are displayed. Note: If you make any changes to the table with this option selected, the entire table will be affected. If a cell's value is 32.5, it will be rounded to 33 and displayed. If you make a change to another cell and save the table, the new value for this cell will be 33 - it will increase this cells' value by .5. If the original value was 32.4, the new value would be 32. If you do not make any changes, then the table will remain unchanged. Database Update - Fixed a problem with one of the MAPs in the database giving an error when loading the binary file. 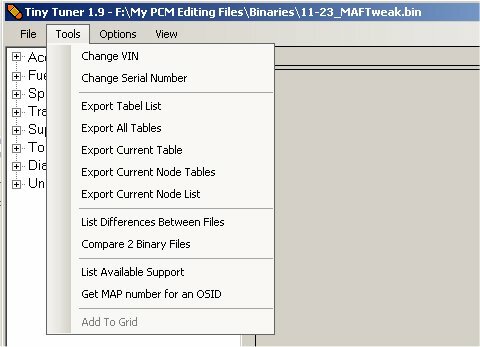 Application Update - Fixed a problem with the program not saving changes to the tables when using the list view instead of the tree view to navigate the parameter list. Fixed an error when saving some parameters using the list box and having auto saved feature turned off. Fixed an error when loading a file when using the DLL. The problem occurs when the program tries to load the sort menu. This requires the database, so when using the DLL it throws the error. and check the option to Use Database When Available. These are located on the Options menu. Here is a link to the thread on ClubGP when I released the public version this software. There is a lot of information about the software in this thread as well as a place to ask questions or post problems. DarkHorizon started a Sourge Forge page to aid in the development of the public release, that page is located here.